A recent article from Michigan Live focuses on an investigation by the U.S. Environmental Protection Agency (EPA) into complaints of improper asbestos removal at an old school for the blind building. Our Boston mesothelioma lawyers know that asbestos removal is a dangerous process. Not only can the removal process lead to additional exposure, an incomplete removal process can leave people with a false sense of security. At this school building, EPA inspectors arrived wearing full body HAZMAT suits to protect themselves from the deadly fibers. When asbestos fibers are breathed into the lungs, they become embedded in the tissue, leaving the body with no effective way to remove them. The fibers then interact with the cells of the lungs and abdomen and can lead to mesothelioma lung cancer. According to reports, the EPA agents are there to assess the spread of asbestos and to collect evidence to use in a potential criminal prosecution against the company hired to remove the asbestos. It is alleged that the company violated mandatory regulations while attempting to remove the cancerous material. The building has been closed since the mid 1990s and was scheduled to be demolished by the investment bank that purchased the property. The area was to be redeveloped following the demolition. 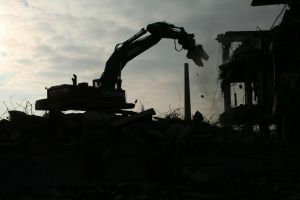 Demolition of a building containing asbestos is a serious and complicated matter. The building must be made safe so that demolition equipment will not spread asbestos dust to the community. This redevelopment project is being funded by a grant that is time-sensitive as to when the work must be completed. If the asbestos was not properly removed, any construction delays could jeopardize the project. A company that is hired to remove asbestos must not only be certified as being properly trained and possessing necessary safety equipment, but the contractor is also generally required to carry an insurance bond to cover any costs to the building owners for problems during the cleanup due to negligence. One major problem is that town residents who become exposed to asbestos are not likely to experience any symptoms of mesothelioma for the next 20 to 50 years. Mesothelioma takes a very long time to lead to physical symptoms, such as shortness of breath, stomach pain, chest pain, and the coughing of blood. Once symptoms occur and the patient is diagnosed, they may likely be in the advanced stages of mesothelioma and facing an extremely painful death in the very near future. Due to the nature of mesothelioma and its delayed effects, your mesothelioma lawyer will need to prove where the asbestos exposure occurred and who has responsibility for your illness. This can be a very complicated process, and you want to make sure that your attorney regularly handles mesothelioma litigation.